But....what's the harm in building such run of the river dams. The real cause for worry is that our Know Alls bark at the wrong dam!! 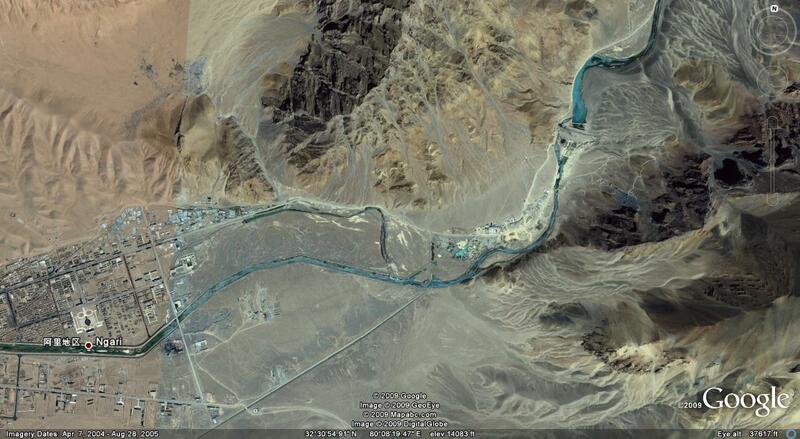 The first picture is of a dam over the Indus built by the Chinese. It is a dam that exists. The first picture is taken from Google Earth. The second is taken by me of Demchog. The big buildings are part of an optimistic market built by the Chinese in their part of Demchog. The electricity produced by that dam on the Indus has come till Tashigong, about 15 kms beyond this Demchog. Unlike the so called dam the Indian Express front paged in an article in its 15th October, 2009 edition that China is building a dam over the Brahmaputra in the Nanshan Prefecture of Tibet there have been many worried analyses of this yet-to-be-confirmed construction. The Chinese have denied it so far, and as yet these reports are at best speculative. This dam can not hurt India as the Mighty Brahmaputra collects 80% of its waters after it enters India. The Mighty Brahmaputra makes an 'S' Bend as it enters India below Spur Top. At this point it is just a small but furious river. After that it picks up considerable waters from the Yangsang Chu at Jidu, the Siyom and the Sipi at Yembung and several others before it leaves the hills at Passighat. Around this place it more than doubles its size with the waters from the Lohit and the Dibong. After that its right bank gets the Himalayan rivers like the massive Subansisiri, the wide Kamala, the Rong, the Kameng (Bharoli), Aie, the Saralbhanga and about forty others. Its south bank too gets waters from copious rivers like the Burhi Dihing, Namdang, Dhansiri, Kalang, Kopili, Digaru, Bajbala and thirty others. These make the Mighty Brahmaputra the size that it is. Not Chinese waters. BUT, what is more worrisome is that since 2004 China had built a run-of-the-river largely earthen dam across the Indus. 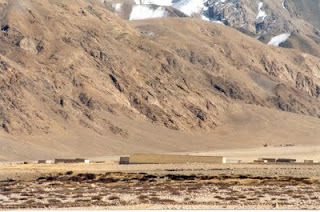 It is only 60 kms or so away from the India-China border at Demchog (Ladakh), and no one has as yet mentioned it even! The cause for worry is not that the Chinese have built a dam, for they can do that, but that no one in India knew about it. It is just 100 kms away from the India-China Border in Ladakh. It provides water for civic and agricultural needs in the Ngari Khorsum province of Western Tibet. It gives electricty for 24 hrs and round the year for the fast expanding and developed towns of Ngari and Shiquanhe (Ali in Tibetan). The former is just 15 kms west of the dam and the latter is 25 kms NNE of it. AND, some of the water is used for irrigation too. Many new fertile fields around Ngari have come up. Even though the Indus at this point and even after it has entereed India at Demchog is a fledgling river there is no excuse for our spies and their latest devices not to have detected that a dam was being built more than 5 years ago. The Indus is even more of a small stream where this dam has been built. It is before its confluence with the Gargunsa Chu- the river that comes past Gartok, the ancient trading centre of Western Tibet and now a thriving electrified busy town. Does not say much for the observation capacity of the intelligent people trained to be on the look out for just such a development, amongst others! What is worrying is not that the dam has been built, for what is wrong in building a run-of-the-river dam, but that our snoops were not able to discover that it was being built and later that it had been built! And then our journalists cry themselves hoarse about a dam over the Mighty Brahmaputra in Tibet that does not exist! That is why the status quo of this picture above has not troubled any one since October 1962! 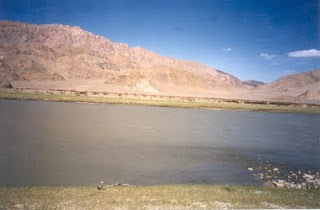 This is of the Indus near Umlung, 20 kms before Demchog, in Ladakh. The other bank of the Indus is in Chinese hands. It is on the southern side of the watershed and yet instead of taking back this singularly unacceptable occupation all that we can think of is- Aksai Chin (about 45,000 sq kms), which is as impossible for us to acquire as it is for the Chinese to even dream about getting Arunachal. There are more than 5000 sq kms of Ladakh, on the southern side of the watershed, that is occupied by the Chinese since October 1962, and this vast almost continuous swath is not even being mentioned at negotiations.